Ethel Magafan and her twin sister Jenne Magafan were born in Chicago, Illinois in 1916. Their father, Petros Magafan, immigrated to the United States from Greece in 1912 and, following the birth of his daughters, decided to relocate the family to Colorado Springs due to health concerns. The mountainous location reminded Petros of his village in Greece and this combination of Western and Greek heritage would become increasingly important to his daughters’ growing artistic tendencies. The sisters realized they both wanted to become artists from a very young age and were encouraged by grade school teachers as well as family members to pursue their goal. The sudden death of their father in 1932 greatly shook the foundations of the family, but as Ethel later stated, his belief in the twins’ artistic talents never truly left them. The twins attended Broadmoor Art Academy (later renamed the Colorado Springs Fine Art Center) for two months, paying their tuition with Jenne’s prize money from the Carter Memorial Art Scholarship. Here, the pair met Frank Mechau, who hired both as assistants, allowing them to continue learning at the school from 1936-1938. Mechau, as well as fellow teachers Boardman Robinson and Pepino Mangravite, would have a great influence on both of the budding artists. From 1937 to 1943, Ethel was commissioned to paint her first of seven government sponsored murals, the first located in the US Post Office in Auburn, Nebraska. This commission made Ethel, age 26, the youngest artist in America to receive such an honor. “The sheer quality of their art at such a young age is significant. Moreover, artists did not give their names when competing for federal competition. This meant that Jenne and Ethel were competing at an equal status with men and were being awarded numerous commissions on the basis of their talent” (Frangos 69). Other New Deal Works Progress Administration (WPA) murals included the US Senate Chamber, the Recorder Deeds Building, and the Social Security Building in Washington D.C., which was painted with her sister. During the difficult World War II era, the sisters would frequently drive across the country together in their station wagon to research and complete assignments. Ethel and Jenne had to save as many gas coupons as possible and rely on re-treaded tires in order to secure their work. After government sponsorship for public murals began to dwindle in the 1940s, Ethel refocused her career on easel painting and successfully earned her first solo exhibition in 1940 at the Gallery of Contemporary Art in New York. Ethel collaborated with her sister to create seven joint exhibits during the course of their careers. Choosing this noncompetitive route strengthened the pair’s bond, yet allowed them to maintain their own artistic styles. The sisters resided in California for nearly five years until, in 1945, the twins permanently relocated to Woodstock, New York after hearing great things from friends about the art colony. After settling, Ethel developed an increasing focus within her work, particularly for horses and abstract landscapes. She met fellow artist Bruce Currie at an artist’s party and the two were married in 1946. The move to Woodstock also represented another important change for the twins because this was the first time the two would not share a studio. The close proximity to each other’s work often made it difficult to differentiate who painted what, therefore the move allowed their art to grow individualistically (Frangos 81). Both sisters won Fullbright Scholarships and Tiffany Foundation Awards which allowed Ethel to travel to Greece and Jenne to Italy. Less than a week after their return to the United States in 1952 Jenne died of cerebral hemorrhage at the age of 36. Ethel stated that the loss of her sister was “a tragedy from which I have never fully recovered” (Tufts 236). In 1956, Ethel gave birth to her daughter, Jenne Magafan Currie, named after her beloved sister. It was also during this time that Ethel began to make annual trips to Colorado to sketch and find inspiration. She was elected an Academician of the National Academy of Design in 1968. Following this achievement, she taught art throughout the 1970’s at both the University of Georgia and Syracuse University. Her stature within the art world was solidified in 1971 when the United States Department of Interior requested that Ethel tour and draw sketches throughout the Western U.S. These sketches were later exhibited at the National Gallery in Washington and then sent on a national tour by the Smithsonian Institution. She painted her last mural, “Grant in the Wilderness,” in 1979 at the Fredericksburg National Military Park in Virginia. From 1962 to her death in 1993, she had 19 solo gallery shows. At the age of 76, Ethel Magafan died of a series of strokes at her home in Woodstock in 1993. Her husband later stated that “if there was one word for Ethel, it would be warmth, because there was never a person or an animal with a broken wing or broken heart she didn’t try to help” (Woodstock Times). Ethel Magafan was a skilled painter from a very young age who closely followed the philosophy of her first and most influential art teacher, Frank Mechau (1904-1946). At the Broadmoor Art Academy, Mechau taught aspiring artists to universalize specific locale, a philosophy later referred to as the Western School of Realism. 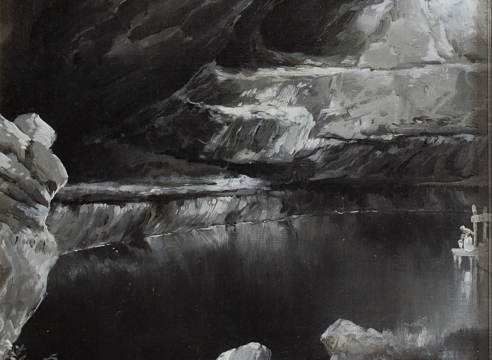 Magafan quickly internalized these concepts, basing many of her early landscapes on the rural areas surrounding her hometown of Colorado Springs. Denver Art Museum director Donald J. Bear once reviewed Magafan’s and her sister Jenne’s work by stating that “their study of local detail makes them appear as little Brueghels of ranch genre – natural and unforced” (Colorado Springs Art Center). This skill also became vitally important to her work as a muralist during the Depression because she was able to go to an assigned location and chose a subject of regional importance. These murals communicated the uplifting potential and history within a specific place and thus spoke directly to their audience. Art historian Karal Ann Marling wrote that post office murals like those Magafan painted came to symbolize a “collective act of faith…the murals were bridges, anchored at one end in the past and vaulting over the present into the world of tomorrow” (Trenton 231). While practical training gave Ethel the tools needed to further her early career as a muralist, it soon became clear that the government sponsorship she sought would also greatly influence the topics of her work. One of her earliest submissions to the Treasury Department Section of Fine Arts was a study of The Lawrence Massacre for the Post Office of Fort Scott, Kansas. The subject was described by the artist as a “tragic event in this town” and that during this time she was “rather naïve” to believe that this subject matter would be accepted (Trenton 230). However, following this lesson, Magafan soon found ways to integrate her aims with local needs as well as government bureaucracy. The result was a stunning seven mural commissions throughout the United States. She focused her subjects mainly on local agriculture and industry but continued to subtlety push against the limitations of neutral subject matter. During the extremely segregated period of the history of the South, she completed a mural for the Wynne Post Office in Arkansas that depicted Black workers in a noble light. As art historian Susan Valades-Despena states, the mural held the “unmistakable message that…competent African-American men are entitled to evaluate the worth of their own labor” (Frangos 73). When available WPA projects began to diminish in the 1940s, Magafan refocused her work on easel painting where she remained successful. Her painting style focused on using a palate knife and egg tempera almost exclusively to harmonize the colors within her landscapes. Prior to Magafan’s relocation in 1945 to Woodstock, New York, she had always shared a studio with twin sister Jenne. The twins exhibited as a pair on numerous occasions, yet insisted that they maintain their individuality as artists. The issue of maintaining her own unique style resurfaced in 1946 when she married fellow artist Bruce Currie. Magafan and Currie kept their artistic ideas separate and kept their studios on opposite ends of the house. They would offer helpful comments about the other’s work, but only when asked. One particularly memorable anecdote occurred when Ethel struggled to complete a painting. Upon asking for her husband’s advice, Currie stated “‘it looks like you have two paintings here. You have one thing going on over here and another going on over here.’ Her response? ‘Get the saw—we’ll cut this painting in two.’” The end result was two perfectly formed works (Frangos 82). Following Magafan’s trip to Greece and the subsequent sudden death of her twin sister less than a week after the group’s return, her landscapes became much more abstract. She began to seek out the feeling of the scene rather than an exact representation of the view. She also worked in hues that ignored local colors. However, this new style did not negate her lessons from Mechau. She began to take annual sketching trips back to Colorado, thus gaining inspiration for her work throughout the year. Art critic Raymond J. Steiner describes her work as: “a grand vision, one that brings a bracing whiff of mountain air to the confines of a gallery space” and uses the “theme of the outside world [to bring] the viewer ‘inside’ the work” (Steiner). Her use of abstracted color creates a symbolic environment and emphasizes a natural world where man and animal become the least important elements included in a painting. 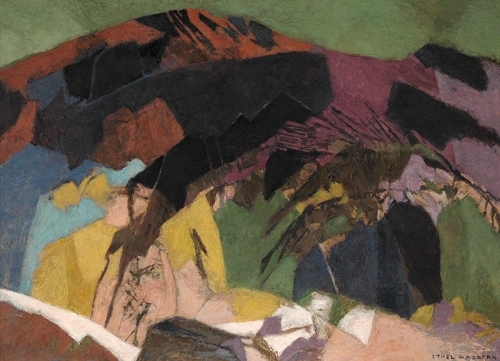 Overall, simplicity, open space, and timelessness became the focus of Magafan’s work, thus allowing one to see the steady progression through her career from social realist to abstract landscapist. All the while, she remained true to her initial artistic philosophy. United States Department of the Interior, Washington D.C.
1. Frangos, Steve. “The Twin Muses: Ethel and Jenne Magafan.” Journal of the Hellenic Diaspora. 31.2 p. 59-94. 2. Trenton, Patricia. Independent Spirits: Women Painters of the American West 1890-1945. University of California Press: 1995. 3. Tufts, Eleanor. American Women Artists 1830-1930. International Exhibitions Foundation for the National Museum of Women in the Arts Washington DC: 1987. 4. Twine, Tinker. “Late Ethel Magafan leaves legacy of murals and paintings.” Woodstock Times. 27 May 1993. p. 34.